The arts are alive in Halifax County, and the Halifax County Arts Council (HCAC) really rocks the Roanoke Valley! As part of their efforts to promote art in our area, the HCAC “released” their Roanoke Valley rockfish at the Roanoke Rapids Public Library. Many representatives from the HCAC and City of Roanoke Rapids were present for the release. In comments made at the ceremony, Sherry Hux, HCAC president, said the Arts Council was proud to be a partner in the Roanoke Valley Rocks campaign and to give this gift of public art to the City of Roanoke Rapids, especially being located at the Library, a great partner of the HCAC . To really make the fish their own, the HCAC put out a call to their membership for design ideas and selected an artist – Nathan Davis, Chaloner Middle School 7th grader – to paint the fish. Nathan, son of Sarah Davis and grandson of Jane Deese, both of whom have painted fish as part of the campaign, said that his grandma (Jane) got him inspired to do the project. He said it took three weeks to complete because of schoolwork. When asked how he came up with his design, Davis said that all forms of art are represented on the fish – painting, music, dancing, theatre etc. Davis hopes that the rockfish is the first of many big art projects for him, as he aspires to be an artist. 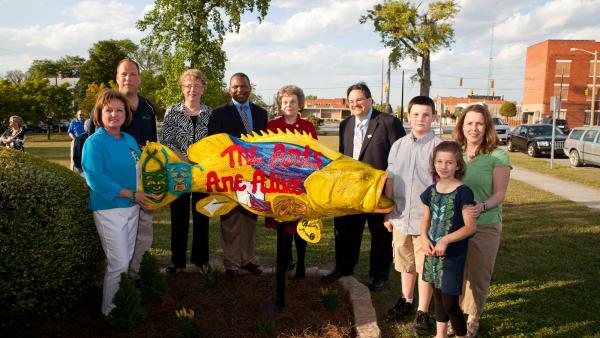 RR Parks and Recreation Director John Simeon, Mayor Pro-Tem Carl Ferebee and Director of the RR Public Library Jeff Watson all expressed gratitude for the fish and appreciation for the larger significance of celebrating the arts. The HCAC thrives because of members and volunteers. The organization always welcomes new members.